With Kirkland’s Spin to Win App you can get a new coupon every day to use at your local Kirkland’s, and you can find inspiration in our design tips gallery. 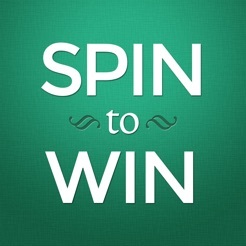 • Use the Spin to Win app to get a new coupon every day. 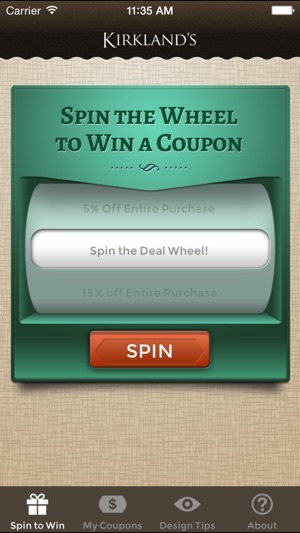 You never know which coupon you’ll get, but every spin wins. • You can save as much as 15% off your entire purchase! • No printing necessary. Just show the coupon on your phone to the cashier at checkout. • Coupons are good at any Kirkland’s location for the whole day. 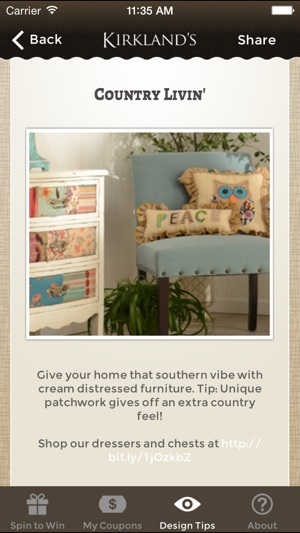 • Get inspiration from our design tips while you shop. 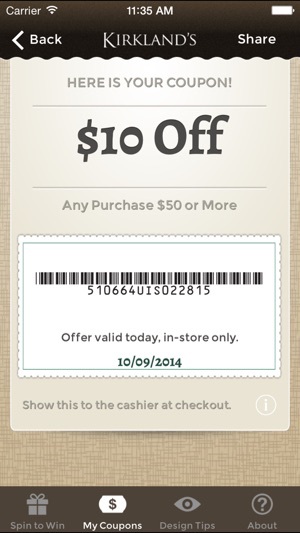 • Coupons must be used at a Kirkland’s location on the day awarded. 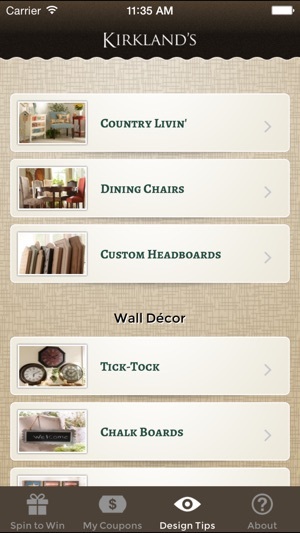 • You may still access the Design Tips and other content even if you don’t spin the coupon wheel. I’m content to often spin 20% off at checkout because even a slight discount is helpful. I haven’t found a better and valid Costco coupon. The app works perfectly . No app glitches. I’m recommending this Kirkland app to others. Today, my timing was off so I clicked stop on $10 off a minimum purchase of $50. I won’t use the $10 coupon since we only need a few items two day before next pay day. This app usually works perfectly; however, I was in Kirkland's tonight and wouldn't work. It kept crashing, saying it wouldn't load, and that it wasn't connected to the internet. I even deleted & re-downloaded the app, as well as, restarted my phone. I've never had this problem before. If this was fixed, I'd give it five stars because I love this app!